Happy Friday everyone! We made it! WOOHOO!!! This weekend looks to be a blast! I have a Halloween party to go to and still really haven't decided on what makeup I'll be doing. I'm going as a cat. Of course I'll have pictures of the costume and I'm hoping to film a video on it. (Sorry I've been lacking in the video department... Life's been hectic!) But during the week I tried some different looks here's what I came up with! 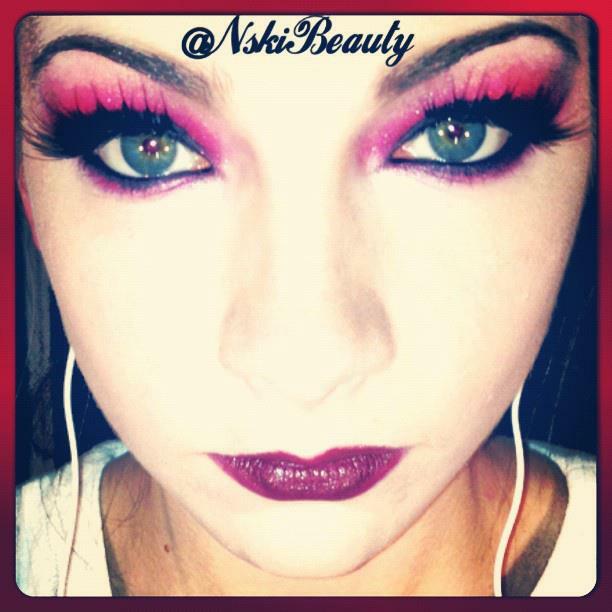 Black, Red & Bright Fushia Look. I'm still not satisfied with a cat look but I do love how the looks came out! I don't know we'll see what I come up with Saturday! But any who on to this weeks Friday Favorites! Favorite Treat: These quick and easy treats! So yummy! Find the recipe on My DelFabulous Life! Favorite Indulgence: Dreaming up an amazing wardrobe.. You know one that would have this in it! Favorite Shoe: Rocking these bad boys this weekend!